Workflows in Sage CRM can become long and a user may wish they had a version of the diagram that is available when the workflow is constructed. You can see from this image below that an extra button has been added to the Opportunity screen. In this example application, when the 'Workflow Map' button is clicked, the current opportunity is checked to see if the record belongs to an workflow. It the opportunity is attached to a workflow it determines which workflow has been used and produces a diagram. The current workflow state is then highlighted (in red) in the created diagram. The user is also given a primt button which will allow the page to be printed and a continue button that will return the page to the opportunity summary page. An entity like opportunity may have multiple workflows available to it. But an individual opportunity record may be attached to only one workflow. 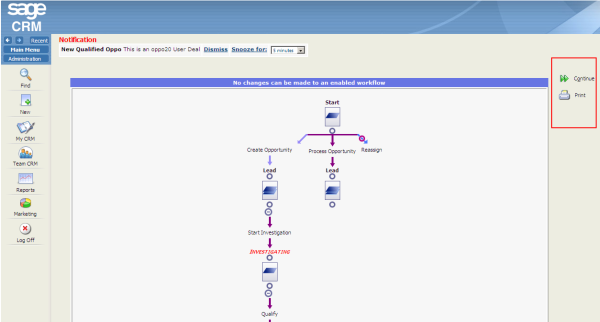 The example custom page used here will detect which workflow diagram should be displayed. The button on the Opportunity Summary screen has been built by creating a new Button Group for the Opportunity Summary system action. The Tab option calls the ASP page "showworkflow.asp". 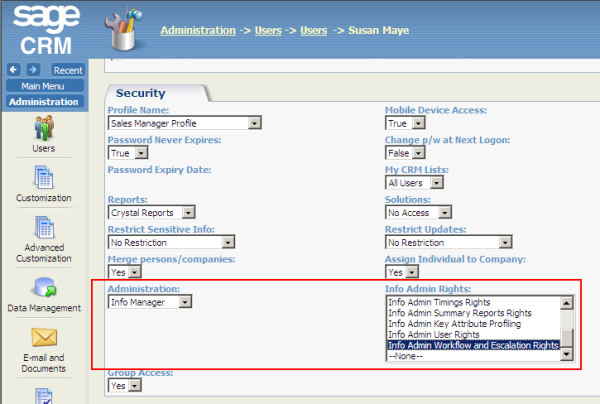 //this example will only work if the user has full admin rights or is an info manager with workflow rights. //Instantiate the Object to carry out the XML request. The Page is designed to be reused in any of the main system entities that use Workflow. At the beginning of the code there is a switch case statement that is used to detect which context the page is being used in. The page uses a serverside HTTP request to fetch the diagram from within CRM. The diagram is part of the workflow administration screens. Two web requests have to be made to produce the diagram, this is because the diagram is not usually expected to be called except within the system administration screens. The HTML returned has to be processed to removed the edit buttons. The current workflow state is then highlighted by adding additional style information into the HTML. The diagram HTML is added to a CRM content block and in turn is added to a container. The print and the continue buttons are added to the contain and the page is returned. I have tried to implement this but I can only get it to work when the User connects to CRM on the actual web server (localhost). When they connect normally (even using the Admin account) I get the "Time Out Error" message. I haven't modified your code at all. this is a good work when it would run. But at the moment there is still the issue Hawkins mentioned. Could you have a look into? I've tidied up the code a little. BUT I am now getting the time out message when testing from another machine. I would have to go back to the beginning. I don't have a fast answer for this. Is it possible to simply print the workflow map from the administrator view in Sage CRM 7.3? I want to have a printed copy to share and discuss with managers about making workflow edits, so I don't need to show the current state within the workflow, I simply want to show the workflow itself. i tried this example on a 2018 instance and get timeout error, what is the reason for this timeout ? Not sure if this is still relevant, seeing as no-one has a working solution yet. I built this guy a little while ago, we only work-flowed the opportunity entity, it's easy to jack up and make dynamic. //Get workflow Records: Workflow, state, description etc. //overlay prevents unecessary hyperlinking/clicks etc.